George Graham Reviews Jonathan Coulton's "Artificial Heart"
Each year, on our year-end observations about the music world, I note the growing evidence that the days of the major record labels are over. In 2011, the rather unsurprising development was the sale and breakup of once mighty Capitol/EMI Records, home of the Beatles. The back-story to our album review this week is a kind of personification of the new paradigm in the music business: a very independent artist who has become apparently a reasonably successful Internet music entrepreneur, adopting the new ways of distributing music, and being open to uses of his music that would have been anathema to the big old major labels. He is Jonathan Coulton and his new release, available both on-line and as a physical recording, is called Artificial Heart. In a way, Jonathan Coulton is an ideal artist for this way of doing things in the Internet age. Born in 1970, he showed interest in music at an early age, according to his website, and played in his high school marching band. He graduated from Yale where he studied music. He sang in a couple of a cappella groups on campus, as his interest in music further grew. After graduation, he had a couple of essentially desk jobs in the music business, at a record company and a talent agency. Following perhaps a familiar path in the life of a musician, he worked for a time in an espresso shop, but he had a chance to perform there from time to time between serving customers. After that shop closed, he got a job with a software company, where for eight years, he wrote "code," as they say. He continued to make music on the side, and released some modestly-selling recordings, mainly, as he describes, as an ego-boost. While performing music on a series of lectures that a college classmate and collaborator was giving, Coulton was invited to perform a conference called Pop!Tech in 2003, and eventually he began to find audiences among the tech-savvy. He also got a job as "contributing troubadour" for Popular Science magazine, which was providing downloadable supplements including his music. In 2005 Coulton decided to concentrate full-time on music, and has had an voluminous and friendly website. He gave himself a project of creating a song a week, and he did that for a year, calling it his "Thing a Week" which resulted four albums. Notable is the release of his music under the Creative Commons license, whereby anyone can use his music for whatever they like in a non-commercial manner, including mix-tapes, sampling, and so on, as long as there is attribution. This is about as far from the practices of the old record labels as one can get. One of the songs on the Thing a Week series became a kind of underground hit, the seemingly autobiographical Code Monkey about a geeky software writer's attempt to strike up a relationship at work. Since then Coulton has been steadily releasing material sometimes in smaller bites, with the Internet allowing the release of bunches of music not necessarily the size of traditional albums. But now he is out with his first full recording since the last of the Thing a Week series. Of course, this new business model would be of academic interest if the music were not there, and on Artificial Heart it is definitely is. The word that first comes to mind when I listen to Jonathan Coulton's music is "clever." His songs are smart, the lyrics are frequently whimsical but often quite astute, and the music is infectious pop you can go around humming, even though it's hardly three-chord rock. Artificial Heart's songs are frequently short and sometimes have quirky instrumentation. One can be reminded of They Might Be Giants, and in fact, John Flansburg of TMBG was the producer. While much of the recording features Coulter on various instruments in his home studio, with a regular band, there a number of guests, a couple of whom do lead vocals, most notably Suzanne Vega. The songs cover a variety of topics, most frequently relationships, often with a twist, going someplace you would not expect. 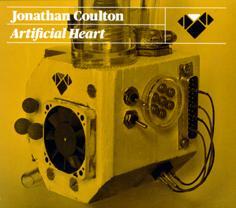 Jonathan Coulton's new CD Artificial Heart joins the ranks of recordings of clever and attractive pop that periodically turn up -- music that's instantly appealing but generally too sophisticated and witty for the commercial pop scene, in the tradition of artists like They Might Be Giants, XTC and Fountains of Wayne. It's a very well-crafted album with polished, honed songs -- 18 of them in all, most a model of succinctness, and almost none would be what I would call filler material. Our grade for sound quality is close to an "A." The recording is clean, and generally free from unnecessary effects, though there are some interesting sonic treatments at times. I would call the dynamic range acceptable for this kind of music. Coulton is notably getting by without the corporate music industry, attracting fans on the web, operating in the new paradigm of the Creative Commons approach to the use of his music by others, selling his music on the web, and seeking donations from fans who download. On NPR's Planet Money, he admitted to having Internet receipts of over a million dollars since he started in about 2005. So perhaps that bodes well for a new paradigm for making and selling music. But whatever the business model, Artificial Heart makes for upbeat, worthwhile listening.